One solution would be to make the volume slider vertical. But this would not work for other menus (like the Bluetooth menu), and would look awkward with other items in the menu. Another solution would be to use a timer for closing the current menu and opening a new one. This is what Windows does for submenus. But it has the drawback of slowing down browsing, which would be worse for top-level menus than for submenus. However, this feature in Gtk+ has been broken since July 2013. <https://bugzilla.gnome.org/show_bug.cgi?id=710388> The code, once fixed, should be applied to menu titles as well. Thank you for helping with making Ubuntu better by reporting this bug. We've briefly discussed this issue on IRC and decided that this issue deserves some more attention. I'm marking this bug as Triaged and am opening an task in the upstream project so we can keep track of it there as well. I'm going to switch this to a GTK+ bug. Really GTK+ should handle this, we're just using shorter menu titles than it's used to so I don't think anyone has noticed before. It might be worth considering (if it's even possible) only having a timer on menu opening if the mouse is actually moving diagonally. That way might keep the responsive feel when moving from menu to menu whilst stopping the reported behaviour. This problem has been solved repeatedly time-and-again since the mid-1980s. The solution is a triangular bounding box and should be something that the standard GtkMenu/Qt menu widget should be doing automatically. If the indicator widgets were switched to be standard GtkMenu/Qt widgets then this should be solved immediately (as would the issues of keyboard interaction and scrubbing). The indicator menus are standard GTK menus, which is why this bug is filed against GTK. GTK menu titles have never had the same diagonal forgiveness that submenus have had. mpt: thanks for the clarification; so it's more that the *existing* sub-menu code should also be applied to the top-level menus (for Gtk+). unasigned brastche as he is not on the project anymore. 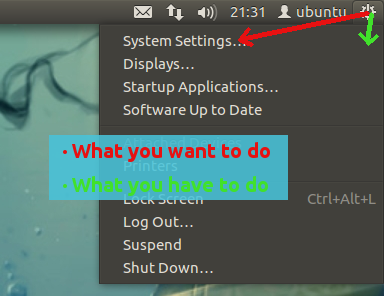 Why don't you take a look at how GNOME-SHELL avoids this unpleasant behavior?